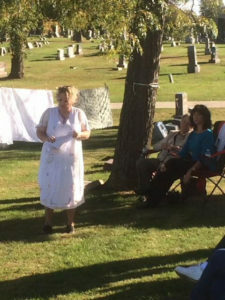 About a dozen people who are buried in the Clarinda Cemetery will be revived by historic reenactors this weekend as Page County residents portray everyday citizens from the community’s past. Trish Okamoto, curator of the Nodaway Valley Historical Museum, says this year’s cast of characters includes three Civil War veterans who survived the Andersonville, Georgia, prisoner-of-war camp where the Confederate Army held Union soldiers. Okamoto will be portraying a country school teacher from the 19th century named Phoebe Griffith who claims to have met a mermaid while touring Bermuda. A sea maiden may or may not make an appearance this weekend. Okamoto stresses this is not a scary event. The annual cemetery walk, a fundraiser for the museum, includes no ghosts or zombies.